A night of toe-tapping Scottish music and entertainment will take place next Friday. 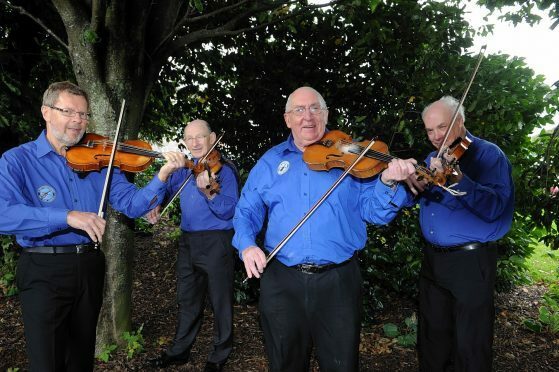 Elgin Strathspey and Reel Society is holding its Grand Concert of Fiddle Music with guest artists already lined up to play at the popular event. Cromarty folk duo Fyrish, David and Marjory Cowan, will be performing their large repertoire of traditional and contemporary music. In addition to them, Ivan Russell and George West will be getting people’s feet tapping with their brand of lively accordion and fiddle renditions. The concert takes place on Friday March 8 in St Giles Church in Elgin. This year, some of the profits raised will support one of the group’s members Ian Anderson, a diabetes sufferer, who is raising funds by running the London Marathon. George West from the group said he was looking forward to the event. Tickets are priced at £8 and are on sale from Sound & Vision in Elgin Cathedral Windows on Elgin High Street, from players and on the door on the night.